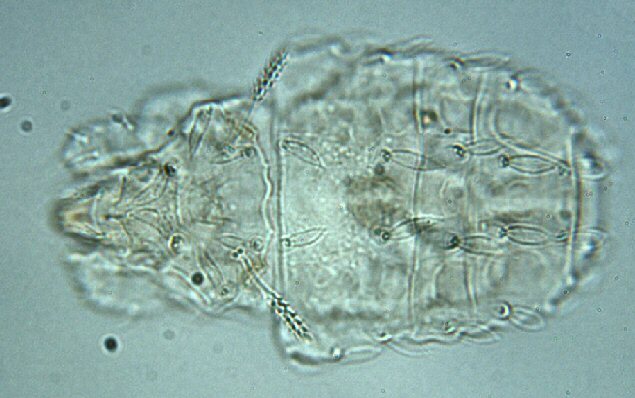 Brachychthonius sp., copyright Zoë Lindo. 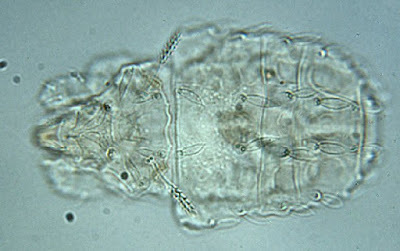 Brachychthonius is a cosmopolitan genus of brachychthoniid mites with two pairs of suprapleural plates and simple, undifferentiated adanal setae. The majority of known species are described from the Holarctic region but a small number of species are known from Africa whereas B. pacificus was described from Samoa (Subías 2004). Characters (from Balogh & Balogh 1992): Notogaster with two transverse sutures and three shields, no setae arising within sutures; shield Na bearing two rows of setae (c and d); fields of shield Na appearing in pairs, two groups also in median line, separated by transverse stripe; seta d2 in marginal position, aligned with longitudinal row of setae cp-e2. Two discernible pairs of suprapleural plates (SpC, SpE). Epimere IV with four pairs of setae. All three pairs of adanal setae thin, simple, setiform. Peranal plate present. [W91] Weigmann, G. 1991. Oribatid communities in transects from bogs to forests in Berlin indicating the biotopes qualities. In: Dusbábek, F., & V. Bukva (eds) Modern Acarology: Proceedings of the VIII International Congress of Acarology, held in České Budĕjovice, Czechoslovakia, 6–11 August 1990 vol. 1 pp. 359–364. SPB Academic Publishing: The Hague.